So Much Wine, So Little Time…..
OK, the holidays are here and I’ve finally decided to do something about …..”the wine”. I say it like that because it has assumed that kind of status – you know, like “the monster in the back room” or “he who shall not be named”. Well, yeah, I do exaggerate a little, but that was the gist of it. So, I took up ….. wait for it ….. buying wine on the internet. And I was quite good at it. I’d find something I really liked, and then I’d troll the internet to get it at a really great price. And it was quite amazing, because the diversity in pricing for any particular wine could be as much as 30%. My biggest coup was a case of 2005 Chardonnay from a top Margaret River producer (I’d rather not name it here). On their own website they had it at $42 per bottle, James Halliday (Australia’s foremost wine expert) had it at $42 per bottle, many websites had it at between $37.50 and $45 per bottle, and I bought a case for $347.88 (which is $28.99 per bottle). Great stuff!! I love my hobby!! Now this hobby was quite organic and grew, metamorphosed, and transformed into full-on wine collecting. So over the past couple of years we toured the Granite Belt in Queensland, the Hunter Valley, Margaret River, and of course numerous visits to Melbourne’s own little backyards – the Yarra Valley and the Mornington Peninsula. We used to do this sort of thing 35 years ago, but what with children and work and moving overseas and coming back, etc, we’d stopped. Now we really got into the swing of it. 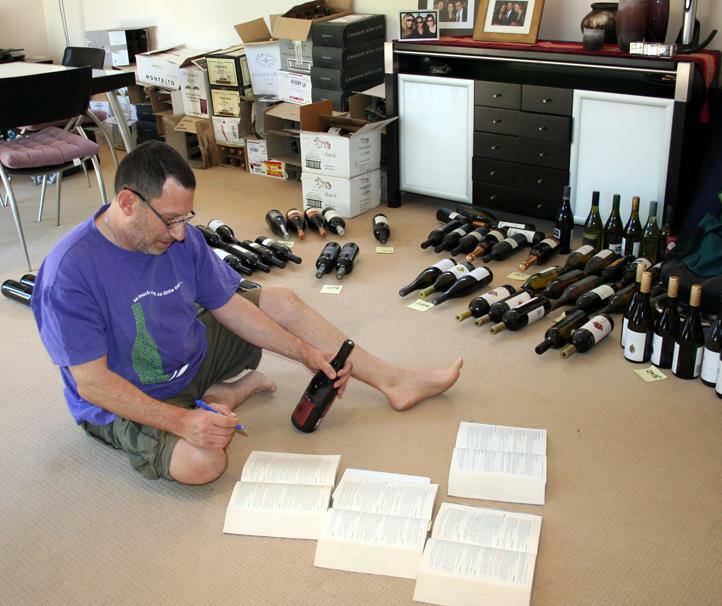 And by the time I got sick in April, I had a collection of around 60 dozen bottles of wine, of all varieties, all in different boxes (with no labels), and all over the place in our front room. While I was in the hospital, Helene and her mother “tidied the front room”, which is code for “moved my half-all-over-the-place boxes of wine into the dining room, where they are now stacked in a completely-all-over-the-place pile”. It is an eyesore. I mean really, it just looks shocking. Cardboard boxes, half torn, different shapes, just lying higgledy-piggledy all over the place. We have some really beautiful dining room furniture – a table and two buffets made of very dark beech with white glass and stainless steel legs. The cardboard boxes stand out like proverbial dogs’ body parts. It’s impossible to find anything. Every time I go to get a bottle, it can take up to half an hour, and even then, I don’t always find what I’m looking for. Worst of all, the wine is getting ruined. There are bottles which really should have been drunk in 2008 or 2009 (or earlier), and that are no longer good. And it is all getting moved around so much, which is also bad for the wine. So, I bit the bullet. I’m now organising. I just started yesterday, and I’m having a ball!! My biggest decision though has been: How do I sort my wine? See, there are a few alternatives – here comes another list!!! By region. There’s something to be said for this. All the Margaret River wines together, etc. Alphabetically (by winery). Those that know me and my penchant for sorting things alphabetically will know that this really speaks to me. My books, my videos, my CDs are all painstakingly sorted like this. I really like this, and I have a number of reasons for really liking this (surprise, surprise). I can now drink the stuff that should be drunk now, thereby eliminating having to throw out bottles which are off. And now, I’m off to the back room to continue my sorting.